There are six insulated/heated bunkhouses with beds. These are available on a first-come-first-served basis and are provided by your registration and facility fees. One building is designated for women only and the rest are labeled for men or family use. Tent campers, trailers or RVs are asked to set up around the perimeter of the two observing fields. The camp does not support RV hookups at this time and you cannot plug your rigs into Okie-Tex power cords or the camp outlets. 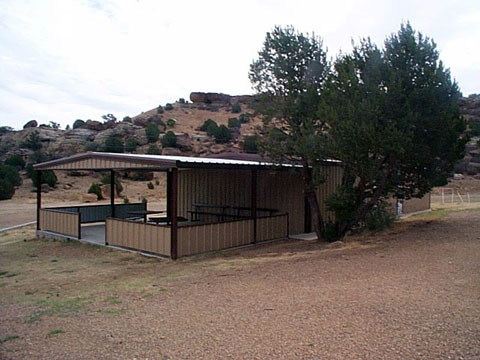 If you require full hookups for your camping rig, you can arrange for these separately at nearby Black Mesa State Park 580-426-2222. There is a large community building that houses the showers and bathroom facilities for the camp. These are available as well as portable toilets scattered near the observing fields for the comfort of our guests. This building also houses the vendor hall, registration table and the kitchen area that is used by the caterers during the day. At night it becomes the Cosmic Cafe. 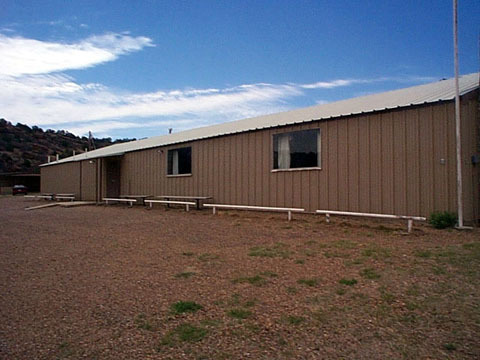 Catered breakfasts, lunches and dinners are available at the Camp Billy Joe Community Building during the star party. These meals are provided by Jody's Catering. The meals are priced separately and are in addition to your star party registration. In addition, the Cosmic Cafe opens each evening from approximately 10:00 PM until 2:00 AM where you can get burgers, hot or cold drinks, snacks and other goodies. Click here for the this year's menu. Kenton - This tiny town of 17 people is the only community in Oklahoma on Mountain Standard Time. Note: The Kenton Mercantile is CLOSED. Boise City - This city serves as an anchor for a trip through Oklahoma's Panhandle. With restaurants, hotels, RV camping and shopping, modern-day travelers can prepare for their journey before setting out to explore the history of the Santa Fe Trail.